There have been many exciting changes at GAP Promotions over the past few months. Our team has grown as we have added team members in graphic design and new business and we are working with a number of new and very exciting clients. And, perhaps most notably, the company has moved to historic downtown Gloucester! The new GAP headquarters sits in the heart of the city, on the corner of Washington and Main in the old Blackburn Tavern. Our new office space carries an abundance of Gloucester history, and GAP Promotions also plans to leave its mark. 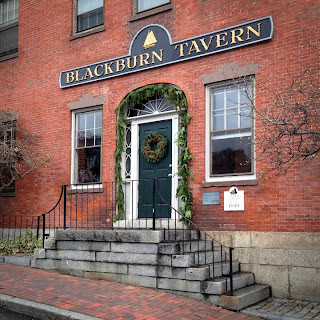 There are two signs posted on the sides of the building, both displaying the name “Blackburn Tavern.” The name ‘Blackburn’ refers to Howard Blackburn, a fisherman who became famous for his heroic voyage in 1883. He and another fisherman were stranded while fishing on their schooner Grace L. Fears, when a sudden winter storm hit and Blackburn lost his fisherman’s mittens overboard. He knew his hands would freeze, but he rowed back to the shore of Newfoundland in five days, braving the weather and lack of provisions. Unfortunately, his fellow fisherman died on the journey. Upon arriving in Newfoundland, a family took Blackburn in and tried to nurse his frostbitten hands and feet back to health. But, he was unable to salvage any of his fingers and he also lost a toe. This did not stop the navigator, as he continued to sail and ultimately became an important Gloucester businessman before passing away in 1931 at 73 years old. In the spirit of Howard Blackburn, GAP reclaimed the helm of Blackburn Tavern after minor renovations designed to maximize creativity and “outside the bottle” thinking. Over the last seven years, GAP has grown and evolved substantially, to ensure that we continuously meet the needs of our clients. Now with a larger graphic design department, GAP can further assist you or your brand in achieving success in the market. The graphic design department’s repertoire of abilities includes: branding, logo design, print and web ads, website design, signage, and T-shirts, among many other things. If these are things GAP can help you with or if you need more information, contact Parker Olen at 888.88.GOGAP or parker.olen@gappromo.com. There are many key points to remember when making the right choice for your Branson web designer. These apply to all businesses who are currently seeking a web designer for their new project. Do you want to start your own business? Are you in need of a website? Choosing a web designer can be a minefield. Read on for the top 7 points you need to check on a web designer's website before handing over any money. Its acutely impressive, that is the account you adore I agreeable it. I accept additionally this accompanying site. When hiring a able website designer, accede hiring addition bounded who can action you accountability, adjustable service, and best armpit design. I read your blog, Its really awesome, I have also a blog which is related with you, which is about Logo Design Massachusetts. here is how can you do it at as low a cost as possible.